Assistant Head of School Ann Pickrell shared the most notable of these student accomplishments and recognized overall distinction among the Class of 2017. The Academic Awards Ceremony, held on May 27, celebrated outstanding academic achievement for the year. There were 87 students who received prizes for their academic accomplishments during the school year. Ms. Pickrell asked that all recipients of course awards and prizes stand and be recognized for their achievement. She also highlighted excellence at each grade level asked them to stand as their name was read. For the 9th grade there are 3 prizes. Julia Farnham was the recipient of the Head of School Prize, Steven Wang was the recipient of the Yale Prize and Nathaniel “Nat” Markey was the recipient of the Bowdoin Prize. For the 10th grade there are three prizes. Madeleine Elsea was the recipient of the Head of School Prize, Glede Wang was the recipient of the Smith Prize and Robert “Robby” Hill was the recipient of the Williams Prize. For the 11th grade there are five prizes. Sophie Carellas was the recipient of the Head of School Prize, Sophia Schaefer was the recipient of the Lincoln Granniss Prize, Sabrina Liew was the recipient of the Holy Cross Prize, Madison Fulcher-Melendy was the recipient of the Dartmouth Prize, and Anabelle Farnham was the recipient of the Harvard Prize. Before presenting the senior class prizes and awards, Ms. Pickrell made announcements about the Williston Scholars program. This year we offered seven courses within our Williston Scholars program and there are 10 seniors who were recognized for their exemplary work. 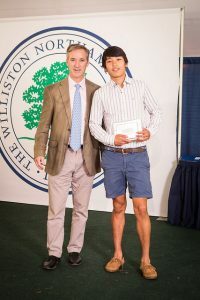 The following are the Senior Prizes, awarded each year at Commencement, as voted by the full faculty and presented by Head of School, Robert W. Hill III. CONGRATULATIONS AND BEST WISHES TO THE CLASS OF 2017! WE WILL MISS YOU! Please come back and visit us often!